Knott's #MerryFarm is Bringing the Holiday Cheer! The holiday spirit is alive and in full swing at Knott's Berry Farm, in fact Knott's has completely transformed into the merriest place around- Knott's Merry Farm! My family and I were lucky enough to attend for the 3rd year and this time with a little bit of surprise SoCal rain. Knott's Merry Farm is open now through January 8, 2017. Keep reading to hear about some of the fun stuff you can expect. Knott's Merry Farm season has begun and it has officially bought the holidays to Southern California! This season is all about spending time with the people you love and cherishing the memories, what better place to do that than Knott's Merry Farm? There is so much to see and do for the whole family. Keep reading to hear about the fun you can look forward to. The entire park is decorated beautifully for the holidays and it only get's better at night when all the lights come on and everything glows. I love to find all of the cool ways that the park transforms into Merry Farm. Keep an eye out while in Camp Snoopy, you can see how they transformed Lucy's 'Psychiatric Help' booth into a 'Mistletoe Testing' kissing booth and of course, Snoopy's house is covered in snow. A definite must when visiting Knott's Merry Farm is the 'Merry Christmas, Snoopy!' Ice Show at the Charles M. Schulz Theater. Not only is it super fun to watch Snoopy skate and dance around, but all of the Christmas songs and stories the skaters tell will touch your heart and put you in the holiday spirit. Although I enjoy all of the ice show, here are my three favorite parts. Snoopy does a mean Single Lady dance! I cry every time I see the "I'll be home for Christmas" act. I get the chills when Linus comes out and gives his famous Christmas speech. Of course, I can't forget about the snowfall during the show. One of my favorite moments from Knott's Merry Farm, is looking over at my daughter's faces as they look up to catch the snow. There are a lot of Santa's around during the holidays, but my favorite can only be found at Knott's Merry Farm's Santa's Christmas Cabin. For the past two years, my girls have looked forward to telling Santa in person, what they want most for Christmas. As you can tell from the photos, Santa not only takes the time to ask each child what they want for Christmas, but he also tells them to be on their best behavior so they can make sure to be on the Nice list. After having their photo taken with Santa, we were ready to enjoy some warm delicious holiday treats. While in Santa's Christmas Cabin you will find hot chocolate, cookies and milk or eggnog, chocolate dipped desserts, and yes, that big yummy Snoopy cookie! Both cute and delicious! I was so happy to finally take a ride on the classic Christmas on Engine 41. The steam engine train that runs throughout all of Knott's Berry Farm is 143 years old and as we sat in an open air car in the back, we were greeted by some very entertaining bandits. After saying he was seeing double when looking at my daughters in their matching dresses, one of the bandits offered his pistol to my husband, saying he'll be sure to need it. Haha! Everything glows so beautifully at night while on the Engine 41 tour of Knott's. We were all so excited to head over to Calico town square to be there for Snoopy's Merriest Tree Lighting ceremony. The show is about 10 minutes of dancing and story telling with Mrs. Claus, a couple of elves, Snoopy's very grand entrance and the Peanuts gang of course. The crowd cheers when Santa Claus himself shows up and brings a family on to the stage to help switch the lights on. After the countdown, the Christmas tree lights up and snow begins to fall over everyone in the town square. You can also find snow fall throughout Ghost Town and glowing snowflakes on all of the buildings. I just love all of the holiday magic that surrounds everyone at Knott's Merry Farm. After our visit and all of the memories that were made, I feel full of the holiday spirit. You have from now until January 3rd to experience and create your own memories at Knott's Merry Farm. You can purchase your 2016 Season Passes here for a great low price that includes one visit that you can use this year, for Merry Farm or Knott's NYE! What are you waiting for? Get out and make those memories with your family too. Happy Holidays! Tis the Season for Knott's Merry Farm! 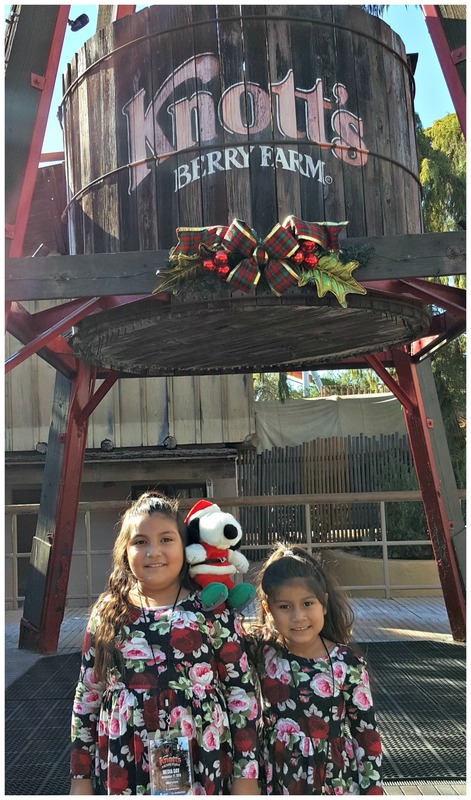 Over the past year I have visited Knott's Berry Farm throughout all of the seasons and holidays and shared them with you. I am thrilled to be attending this year's Knott's Merry Farm to help bring in this holiday season. Knott's Berry Farm is transitioning into Knott's Merry Farm this week and beginning this Saturday, November 21 through January 3, 2016, your family can experience the joy of the season with Snoopy and the Peanuts too. You can follow our family's Christmas Snoopy on Instagram while he is on his journey back to Merry Farm later this week. Here are a few of our favorite things to do and see when visiting Knott's Merry Farm. A definite must while visiting during Merry Farm season is to catch the Merry Christmas, Snoopy! ice show. The characters show off their incredible skating skills while telling your favorite classic stories. The show will touch your heart and if you weren't in the holiday spirit yet, you will be by the time you leave. The best hot chocolate and warm treats can be found in Santa’s Christmas Cabin. Your kiddos can share their wish lists and have a photo taken with jolly ol’ St. Nick while you savor some of Knott’s world famous holiday treats. I don't know how it happened, but last year I missed Christmas on Engine 41. Thlooking forward to taking a trip back in time to celebrate Christmas in the Old West town of Calico. Climb aboard the Calico Railroad for Christmas on Engine 41 and meet Ghost Town residents eager to share their holiday plans with you. Go early and stay late to join Snoopy as he lights up the night in the Snoopy’s Merriest Tree Lighting show. Then take a stroll through Ghost Town where snow gently falls while thousands of sparkling lights dance to the beat of holiday music. You can enjoy all of this and more by Make fun part of your holiday tradition at Knott’s Merry Farm November 21-January 3. Don't forget you can buy your Knott's Berry Farm season passes here for a low price which includes one visit you can use this year, for Merry Farm. Disclosure: My family and I were invited by Gigasavvy to a media day at Knott's Berry Farm to review and share with you all of the awesomeness going on at #MerryFarm. No other compensation was given and as always all opinions are 100% my own. I just love when my entire family gets excited about a new movie. All of us, including my husband can't wait to see The Peanuts Movie. This weekend we were invited to not only spend Halloween morning riding rides and drinking Boysenberry Punch at Knott's Berry Farm, we also got to meet and interview the voices behind the characters from The Peanuts Movie. Since the stars we were meeting were kids, I thought this would be the perfect opportunity for my daughter to do her first interview. A little bit about the movie: Charlie Brown, Snoopy, Lucy, Linus and the rest of the beloved PEANUTS Gang make their big-screen debut, like they’ve never been seen before, in state of the art 3D animation. Charlie Brown, the world’s most beloved underdog, embarks upon an epic and heroic quest, while his best pal, the lovable beagle Snoopy, takes to the skies to pursue his arch-nemesis, the Red Baron. From the imagination of Charles M. Schulz and the creators of the ICE AGE films, THE PEANUTS MOVIE will prove that every underdog has his day. My daughter was so super excited to meet Francesca Capaldi, the voice behind the Little Red Haired Girl who also happens to be Charlie Brown's love interest in the new movie. Capaldi is best known for her work as Chloe on Disney Channel's Dog with A Blog. I think this may have been the first time my daughter has met someone that she watches on TV, so it was kind of a big deal. So, out of all of the Peanuts movies and comics, I must say Lucy is my favorite. I just love her sassy attitude. I asked Hadley Belle Miller, the voice of Lucy what her favorite part of the movie was and she said she likes when she throws the football at Charlie Brown's head. Haha! She also told me that her favorite part of being the voice of Lucy was being able to play a strong female role. Tell me: Who's your favorite member of the Peanuts gang? The Holidays Are Here, Knott's #MerryFarm Is Now Open! Disclosure: My family and I were invited by GigaSavvy to a media day at Knott's Berry Farm just so I can share with you all the awesomeness they have going on. Please note, all opinions are 100% mine. If you follow me on Instagram, then you know how much we love Snoopy and how excited we were for Knott's Merry Farm to start off the holidays this year. Knott's Merry Farm is the perfect place for families to make memories while experiencing fun attractions and holiday cheer. From November 22 through January 4, 2015, visitors are invited to experience all that Knott's Berry Farm has to offer as well as some extra holiday excitement including new shows, snow, food and holiday decor. Keep on reading to find out some more fun details. There was a lot of excitement in our house when we prepared for #MerryFarm this year. My girls already love the rides in Camp Snoopy and when I mentioned to them that they would be able to meet Santa and watch an Ice Show, then they were just over the moon excited. Little did they know, that was just the tip of the excitement that was coming their way. During Knott's #MerryFarm the Wilderness Dance Hall in Ghost Town transforms into Santa's Christmas Cabin and trust me when I tell you, the whole place smells delicious. Everything here is freshly baked and you can taste all of the limited time holiday treats like Milk and Cookies, Pastries, Candied nuts, Egg Nog and Coffee. That chocolate chip cookie was right out of the oven and clearly, brought a smile to my little ones face. Meeting with Santa is a must every year when the little ones are this little, and I was so happy that the #MerryFarm Santa (also located in Santa's Christmas Cabin) lived up to our very high expectations. Santa took the time to ask each of the kids what they wanted for Christmas and mentioned that they should be good boys and girls. And to be honest, that is exactly what my littlest needed to hear. One of the Holiday traditions at #MerryFarm that I sadly missed was the Christmas on Engine 41. I need to go back and check out the fun vintage train ride I heard so much about. I am still hoping to gift our family with Season Passes to Knott's so we can go back and see everything we missed. While visiting #MerryFarm this year, make sure not to miss the "Merry Christmas, Snoopy!" Ice show at the Charles M. Shulz Theater. The look on my daughters face when the snow began to fall is something I'll never forget. The ice dancers were all so amazing and talented and honestly I got a little emotional when the dancers performed to the song, "I'll be home for Christmas" and when Linus came out and gave his speech about the true meaning of Christmas. I missed all the showtimes while running around but of course the Camp Snoopy Theatre has a fun show Lucy's Wish List, perfect for the kids to sing and dance along to. I've only shared some of the holiday highlights that Knott's #MerryFarm has to offer and you have to visit and make some of your own memories. Don't forget to buy your 2015 Season Pass now and receive one free admission this year and of course unlimited visits in 2015 with no blackout dates. Oh and since we are talking about next year, which is just around the corner, get ready to experience the brand new interactive 4-D attraction, Voyage to the Iron Reef, in spring 2015. So tell me: What are you most looking forward to at #MerryFarm this year? Celebrate the Holidays with Snoopy at Knott's #MerryFarm! It's that time of year again! The 2014 Holiday season is upon us and here in Southern California, we have some of the best places to visit with the family. This year we are starting a new holiday tradition at Knott’s Berry Farm’s special holiday celebrations Knott’s Merry Farm. Merry Farm celebrates the Christmas season November 22 through January 4, 2015 and is a fun filled event that includes park-wide lavish decorations, live entertainment, festive food, and a shopping wonderland filled with local artisans. ● Winter wine and craft beer tastings paired with fresh fruit, cheese and more! One of my favorite things about Knott’s Merry Farm is the live entertainment. I love the shows and I love that my girls get to experience fun shows too. While at Knott's Merry Farm, make sure to catch a performance by the world famous beagle, Snoopy as he performs a brand new ice spectacular, Merry Christmas, Snoopy! inside of the 2,100 Charles M. Schulz Theatre. And don't forget to check out a unique live performance of Charles Dickens’ A Christmas Carol or O. Henry’s A Gift of the Magi in an intimate setting of the historic Bird Cage Theatre. The amazing decorations and characters completely transform Knott's Berry Farm into a Winter Wonderland filled with Holiday magic. When the sun sets on the Farm, Calico Stage lights up with the celebration of the season in Snoopy’s merriest, musical, whimsical tree lighting featuring a cast of Toy Soldiers, Snowmen, Elves and America’s most famous beagle, Snoopy! One of the things I am most excited about experiencing this year is Christmas on Engine 41. Introduced in 2013, guests can climb aboard a vintage railcar and meet an ever-changing group of Ghost Town residents eager to share their Christmas plans and songs with you. Oh and of course, the food, you can't forget the food. Knott’s Merry Farm’s elves have created delicious festive treats including Santa’s homemade cookies, sundae bar, decadent hot chocolate topped with hand carved chocolate shavings, and winter wine and craft beer tastings. Savor the ultimate comfort foods with Knott’s world famous desserts, including fresh made-to-order Maple Lollipops, churros from the Churro Factory, cakes, cookies, muffins and gingerbread men in the Farm Bakery, as well as the legendary cooking at Mrs. Knott’s Chicken Dinner Restaurant. Sounds amazing right? I am so thrilled to be able to take my girls to experience the magic this year. Will you be there? If you are in need of an amazing Christmas gift for the family, I have a great one for you: Season passes to Knott's Berry Farm!